There is a selection of hotel accommodation & 2 bedroom self contained apartments at the Quality Inn Airport Heritage Hotel which is ideally positioned only 6 minutes drive from the Brisbane airport and the Brisbane CBD. The accommodation at the Quality Inn Airport Heritage Hotel is of an exceptional standard and very affordable. Stylishly appointed and newly refurbished this Brisbane hotel is situated close to Eagle Farm, Doomben & Albion Park racecourses, Racecourse Rd shopping and dining. If you are looking for discount hotel accommodation in Brisbane then the Quality Inn Airport Heritage Hotel is the perfect place to stay. This budget hotel features a variety of rooms that are designed for both business and leisure travellers as well as great amenities like business centre, conference centre, direct internet access, faxing facilities, free car parking, guest laundry, lift, restaurant, room service, outdoor swimming pool, tour desk, baby cots available for families and daily housekeeping. 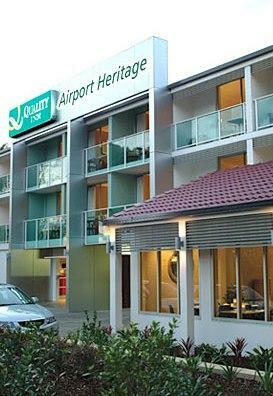 Whether you are a corporate traveller, international visitor, family or leisure guest looking for a central location between the Brisbane CBD and the Brisbane Airport the Quality Inn Airport Heritage Brisbane Hotel is an affordable choice. 2 Bedroom 2 Bathroom Apartment : Sleeps up to 6 guests on 2 Queen Beds + 1 Double Sofa Bed. Deluxe Queen Hotel Suite : Sleeps up to 4 guests on 1 Queen Bed + 1 Double Sofa Bed. Exec Queen Spa Hotel Suite : Sleeps up to 4 guests on 1 Queen Bed + 1 Double Sofa Bed.